Mark London was hired in 2002 to take over top post at MVC. 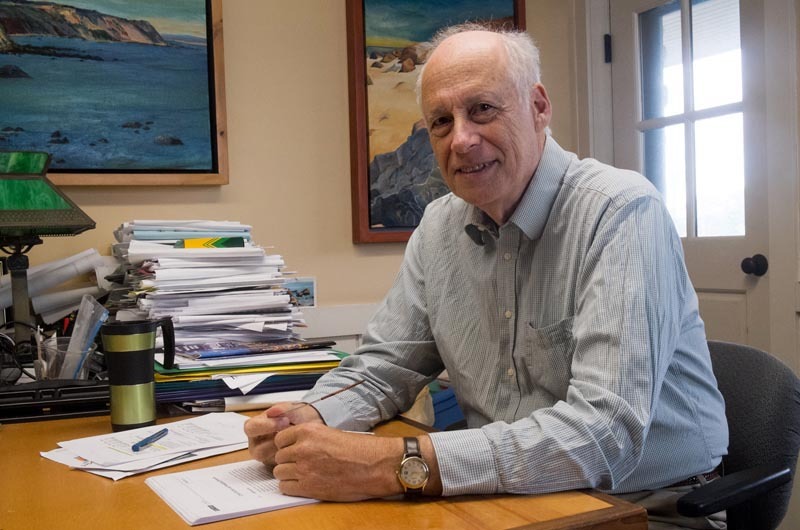 The executive director of the Martha’s Vineyard Commission will retire next year. Mark London quietly announced his news during his report at the end of a meeting Thursday night. He said he had sent an email to commissioners informing them that he would retire by the end of next summer. “What am I going to do? I’m not sure,” Mr. London told the commission. Mr. London has been executive director of the commission for the past 12 years. He was hired to take over the top post at the MVC in August 2002, filling a vacancy left by former executive director Charles W. Clifford. He came to the Vineyard from Montreal where he had worked as a city planner for some 31 years. He had previously been a summer visitor to the Island. “I made a list of benefits and detriments for this job,” he told members of the commission in his final interview for the job in August of 2002. “A detriment is that the Vineyard would no longer be a benefit for me,” he said with a laugh. He was hired with great enthusiasm during a time of internal turmoil at the commission following the departure of Mr. Clifford, and also following a period of high-profile development reviews including the controversial Southern Woodlands golf course development that failed to win approval and left deep wounds between the town of Oak Bluffs and the commission. “This is the people’s commission doing the people’s business . . . I hope we can get over reasonably quickly the current divisiveness,” Mr. London told the commission just before he was hired. During his tenure as executive director Mr. London has presided over a period when planning work largely outweighed high-profile development reviews at the MVC. Among other things he led the Island Plan, a 50-year comprehensive plan that was two years in the making and completed in December 2009. Mr. London lives year round in Chilmark with his wife, Linda Thompson. The commission has had only six executive directors in its 40-year history. Commission chairman Fred Hancock said Thursday that a search committee will be formed to find a new director, and he invited any commissioners who are interested to notify him before the next meeting. “It’s obviously a large job and there is going to be time and it’s an important position to fill. So we’ve got some time to deal with it, and we will,” Mr. Hancock said. All the best to Mark in his new challenge of retirement. Thank you for you good service, and stewardship of the commission.